Relax. It’s only preseason. At least that’s what I try to keep telling myself. But it’s hard to find anything joyous about the way the Buccaneers’ starters have played over the first two preseason games. On Friday night against the Patriots, Josh Freeman was sacked three times in just eight plays. Doug Martin left the game with an injury that, fortunately, doesn’t appear too serious (for what it’s worth, he tweeted “No Worries!! !”) The secondary, worst in the NFL last season, looked every bit like the 2012 group that gave up more passing yards than any other team. 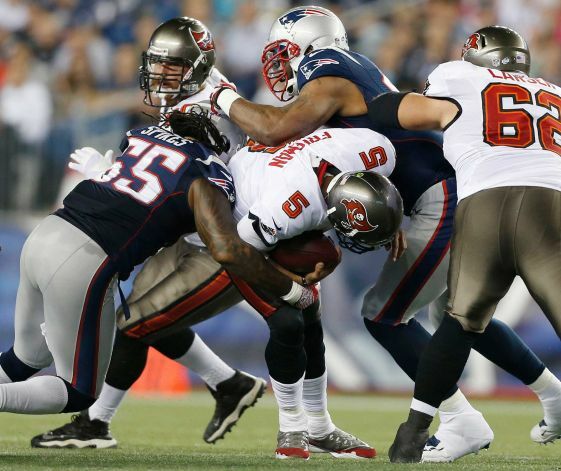 For those who actually care about the final score of meaningless games, the Bucs lost to the Pats, 25-21. I know, I know. Tom Brady is a future Hall of Famer, and looked like one on Friday night. There’s no argument there. Darrelle Revis didn’t play; he should help the secondary. We also didn’t see Carl Nicks or Davin Joseph along the offensive line. They will surely help the pass protection and running game. But there will always be that uncertainty until we actually see these guys back on the field making plays. If everything clicks in three weeks in the Meadowlands, all will quickly be forgotten. Next week, the Bucs face the Dolphins in Miami. The third preseason game is typically the “dress rehearsal” where the starters play the longest. We shall see.